Levittown, New York, the ideal model for post-war housing crisis. In 1941, William Levitt and his brother Alfred were granted a contract from the government to construct and provide housing units to defense workers in Norfolk, VA. An idea was captured and applied 8 years later. Pre-War, the housing industry comprised of local builders constructing 3-4 homes per year. Levitt's assembly-line ideal model would turn out 30-40 per day. 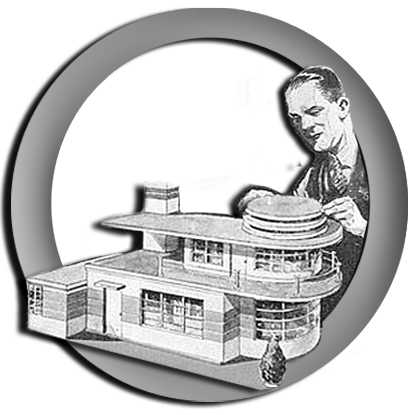 In 1947, the start of his suburbia model set the tone for other builders to follow. He out-paced and out-performed the construction process by breaking down the phases into 27 operations. A 20-acre area was set-up for assembly which comprised of concrete mix and lumber cuts. Trucks delivering material and teams of crafters arrived at intervals. Levitt's plans offered 5 different models although all had the same floor plan. The plan consisted of a 800 square feet home with a picture window, a fire place, radiant heating in the concrete slab, a built-in television set, and an unfinished attic for expansion. Paid by the piece, not by the hour, subcontractors worked diligently to ensure a timely yet quality system. The approach made homes affordable at $7000 and a $57.00 monthly mortgage as Levitt depended heavily on government assistance. Levitt believed the outdoor assembly was his factory much compared to the General Motors. Move-in day for families was a dream come true. Each house stocked by local merchants with laundry detergent, dish soap, dry cereal, even milk in the new refrigerator. Ranch House: First erected in the 1920s, was ever-so popular with the middle class of the 1940s through the 1970s. Still in existence today and found in older communities. This style is basic and includes a low ceiling/roof, minimal interior and exterior features and associated with tract housing. Cape Cod: Also started in the 1920s, revamped in the late 1940s. A boxy rectangular shape, a high pitched roof, narrow eaves, and designed for future expansion. The kitchen was set in the back for housewives to keep an eye on the children. Much more space than the ranch house. The Mid-Century Colonial: Gained in popularity after the Cape Cod appeared to be less sufficient for growing families. The split-level allowed for a built in garage, added decks and porches and quite often, a second story. It added more space within a small lot which was becoming the norm unlike what the ranch house was designed to require, more lot space. Post-War homes were unlike those previous of WW2. Adequate space for a growing family was a necessity. Many homes copied from pre-war styles were selectively modified to adjust for expansion. The kitchen was designed as a task-centric workspace: preparation, cooking, and clean-up. Stainless steel appliances and accessories were built in to essentially reduce the labor in the kitchen and to keep it sanitary. The bathrooms were small and included the basic sink, tub/shower, and a toilet. The walls and floor made up of ceramic tile and usually of bold vibrant peaches, pinks, and aquas with little to no design. The living room was the focal point although constructed with minimal features. The suburbs were designed to relieve the housing shortage as servicemen returned from war and as the nation pressed for a return to normalcy. However, the suburbs catered only to White Americans. Developers alleged that the purchase of a home in the suburbs elevated the working class American into the middle class. Harry Truman inspired nationalism and patriotism into the heart of suburbia. The growth of family was at the center of constructing the ideal neighborhood. Neighborhood swimming pools, baseball fields, schools, shopping centers were important aspects of a thriving neighborhood. The Future: Trends in Community Planning. Why do you need coverage now? What is your budget for the type of coverage requested? Name the highest upcoming project and list its expected revenue? While the craft may be an art, its operations is a business. That's why we are certified in construction risk and we know coverage ranging from Builders Risk to Commercial General Liability to Equipment Coverage to Surety Bonds are essential to a well-oiled operation. Smart building and construction starts with professional trades men and women.